Are any of the angels more powerful than the others? If it is like that then how could Michael the Archangel banish Lucifer if he is a higher level of angel? I’m not sure that any of them can be said to be more powerful than the rest. It’s probably more precise to say that they have different functions. Some are messengers, others are guardians, soldiers against Satan and his demons, attendants at God’s throne, etc. St. Michael and the faithful angels were able to expel Satan and his angels b/c they were given power from God to do so. Why was the rosary shortened from 15 decades to 5? There were originally 15 decades b/c the rosary was used to keep count as monks prayed the Psalms, of which there are 150. Once the rosary was used to pray the Hail Mary and was thus no longer about the Psalms, it no longer became necessary to have 150 beads. In Matthew (8:31-32) when Jesus sent away the demons into the herd of swine, the demons requested it and Jesus did it. Why would he accept their plea? It's His way of showing His power over demons. They can only enter the swine with His permission. Also, bodies of water can represent hostile forces (Psa 69:1-4) that are sometimes personified as beasts that rise out of the sea (Dan 7:1-3; cf. Rev 13:1). By driving the demon-possessed beasts back into the sea, Jesus symbolically demonstrates his triumph over the legions of Satan's kingdom. Finally, it could also be that this is a foreshadowing of things to come. Now, the demons will be cast into a lake of water; when Jesus comes again they will be cast into a lake of fire (cf. Mt 25:41; Rev 20:9-15). A post death excommunication is lifted on someone... what is the point in doing that? It's not going to change where their soul is. I've never heard of this, so I'm just guessing here, but perhaps an excommunication would be lifted after a person's death in order to remove the stigma placed on the person's family and descendants for being known as the relatives of an excommunicated person. Or, it could have been discovered later that the excommunication was unjust for some reason. Remember that excommunications are not about declaring where someone's soul goes, it's about making sure that someone knows that he has separated himself from the Church. An excommunication need not mean damnation to hell. If the person repents of his excommunicable offense, then he can be brought into union with the Church again. Beyond that, I can't really say much on this. If you have a specific example in mind, then that may help me to help you better. Most of us are used to reverencing the Holy Name of Jesus. After all, it is by no other name that men shall be saved (cf. Acts 4:12). Likewise, at the name of Jesus every knee should bow, in heaven and on earth and under the earth (cf. Phil 2:10). 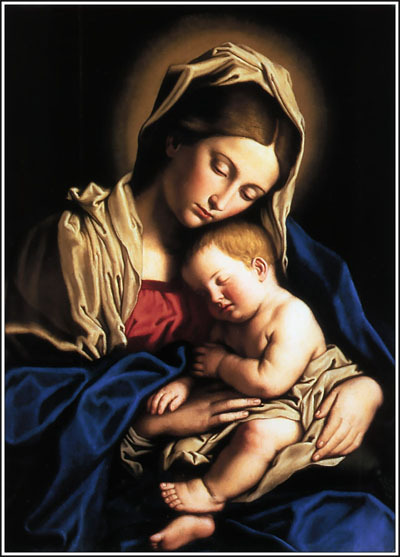 But, on this special day we reverence a different name, "Mary," the Blessed Virgin and the Mother of God. 87. Cf. Isa 43:1; Jn 10:3. If the name is sacred and "demands respect as a sign of the dignity of the one who bears it," then the name of the Mother of God is second only to the name of Jesus, for "Mary" is the icon of God's greatest creature. When we invoke any name, we make that person present, both in our own minds, and in the minds of those who hear it. We also call to mind the saints who bear the name, and who interceed for all those who share the name in common. The name is holy for it makes present God's most dignified creatures. Thus, we should never curse the name of any person. In particular, when we invoke the name of "Jesus" or "Mary," we must ensure that it is always with the utmost reverence and humility. These are not just any old names. Instead, they are the names of the two persons who had the most integral role to play in our salvation. What Does the Holy Name of Mary Mean?